A sound investment for now and the future. The advanced CEL-450/490 series is a comprehensive instrument family for a wide range of applications. It has been designed for convenience and ease of use. 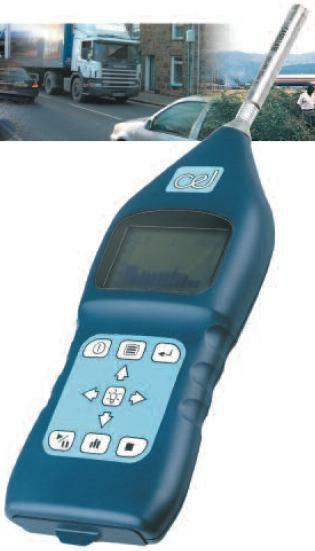 From simple noise at work surveys to full environmental audits, the CEL-400 can do it all simply and quickly. There is a wide selection of models available with Class 1 or Class 2 accuracy, so you can purchase an instrument tailored to suit your requirement. Single 140dB measurement range, no need for range selection. Compliant with latest IEC 61672 standard. Available in both Class 1 and Class 2 accuracy grades. Real-time frequency analysis in octave and one-third octave. Easy to use menu with user definable configurations. Choice of broadband only, octave or one-third octave instruments. Large 2Mb memory capable of storing over 800000 data points. Comprehensive software package with graphical reporting, graphing & analysis functions. Fast storage of noise time history down to 10ms. For selection of Class 1 or Class 2 accuracy of instrument please add the appropriate number to the instrument parts (e.g. CEL-450.A1). Standard kits are available to add a kit case, windshield, download cable, dB23 software, CEL-110 calibrator and operating instructions. For a kit simply add /K1 to the part number above (e.g. CEL-450.A1/K1). UKAS calibration is available for applications where a traceable certificate of calibration is required. There are two main products within the CEL-400 series range, the CEL-450 and CEL-490. The primary role of the CEL-450 model is an occupational hygiene instrument. It can be purchased as a broadband model which automatically calculates noise exposure (Lepd) and can be used for workplace noise assessments. For the selection of the correct hearing protection the CEL-450 features the calculation of LCeq-LAeq for use in the HML method, or a more detailed assessment of the frequencies of noise an employee is exposed to can be made with the octave band (B) model. For product development the 1/3 octave version will measure the more 'tonal' components of noise, giving better assessment of noise emissions and allowing noise reduction techniques to be applied more effectively. In frequency analysis modes the instrument measures all the bands simultaneously in real-time, making for fast and accurate results. The CEL-450 will also measure time history profiles of noise, that show how the noise climate has changed over time. The stored results can then be downloaded, and displayed on the dB23 software as illustrated. The main role of the CEL-490 is as an environmental instrument. This model adds the statistical measurement parameters (Ln%), required for environmental legislation and these can be calculated in real-time octave modes on the relevant versions. The CEL-490 also adds more comprehensive logging functions in the form of period time intervals selectable from 10 milliseconds to 1 hour as well as time history profiling. Automatic start/stop timers are standard functions on the CEL-490 and with an outdoor protection system the CEL-490 can be used for unattended monitoring. Modem kits are also available for remote downloading of data.